Temperatures are very important in industrial processes. A process change has often an influence on the temperature. This is the case for electrical resistance, friction in a bearing, wall thickness in pipe work etc. Temperature is therefore, in many cases an excellent control parameter. 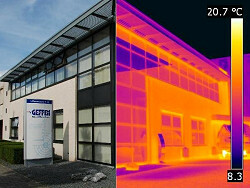 Thermal imaging has an increasing influence in the industry. All materials and objects emit infra red radiation. Thermal imaging is the technology that visualizes this invisible radiation. Van Geffen VMS only uses the most modern and advanced equipment available. The combination of the highest possible resolution and a special wide-angle lens enables us to inspect large surfaces without any loss of quality. Besides the fact that we use the most advanced equipment which is commercially available, are all our inspectors trained and certified according ISO standards and daily perform their inspections with passion and enthusiasm. 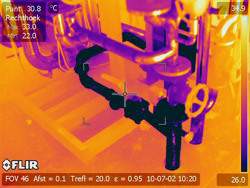 Despite of the fact that temperature is an important parameter for many processes, there are also many problems for which a thermal inspection alone isn't sufficient. 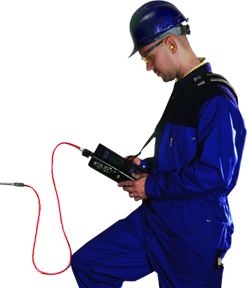 Van Geffen VMS therefore offers a unique combination of vibration measurements and thermal inspections. For condition monitoring on complex machinery, thermal imaging could be an important supplement on the vibration measurements and can enable even more detailed analysis. Besides that we are, in one single visit, able to monitor your machinery vibration, inspect your pipe work for blockage or leakage and detect any cooling problems, overloading and faulty connections in your electrical installation. This combination of disciplines and our many years of experience in industrial maintenance will save you a lot of time, costs and risks. The rapid contactless measurement method and the simple fact that temperature has an important role in almost any process, results in the many applications of thermal imaging. Boiler inspections (up to 2000°C), electrical and mechanical inspections, process monitoring, (steam)pipe and building inspections. Periodic thermal inspections can result in reductions in energy consumption and insurance costs. Insurance companies often require from their customers to have an electric thermal inspection carried out on their equipment. With a thermal inspection report you can prove that you have done everything available in order to secure the safety of your employees and to reduce the risks of downtime, fire or accidents to a minimum. A thermal inspection of your electrical installation is a snap-shot of the situation and is depending on especially the load and the process. Periodical inspections are therefore recommended.